This salad has a small story to it. It was the first food I prepared for myself after being in a major car accident seven years ago. I was still on crutches but out of the hospital, and an occupational therapist was helping me learn how to get around a kitchen with my injuries. 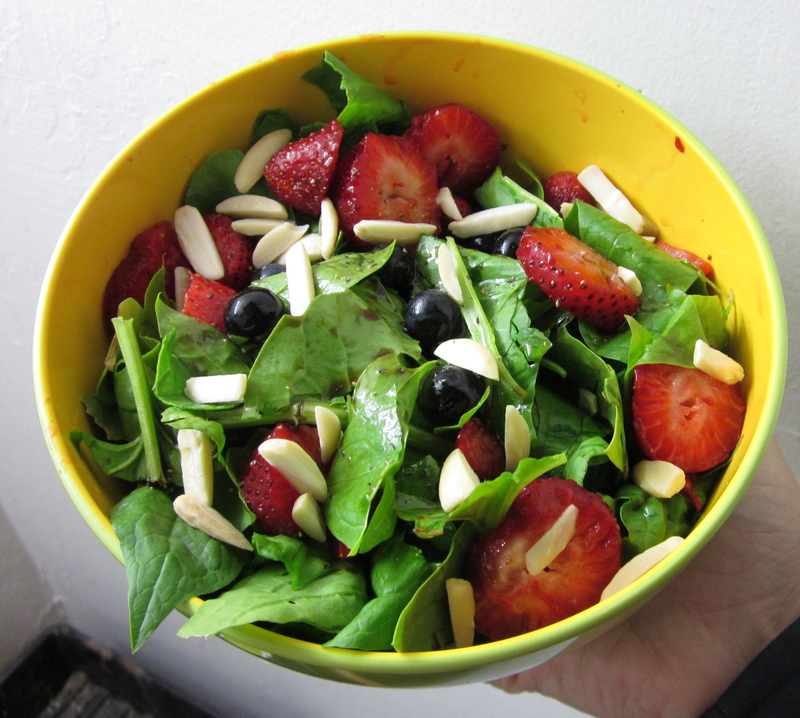 She had me make a version of this salad as a project, to get me used to doing everyday tasks again. I’d never had this salad before then, and it has become one of my favorites. It’s like the best of a green salad and a fruit salad combined. It is so refreshing. I know people who don’t like sweet things in their green salads, but these two berries are flavorful without being that sweet. And there’s something about the deep green, blue and red colors together that just looks nice. If you add enough berries, you almost don’t need dressing. 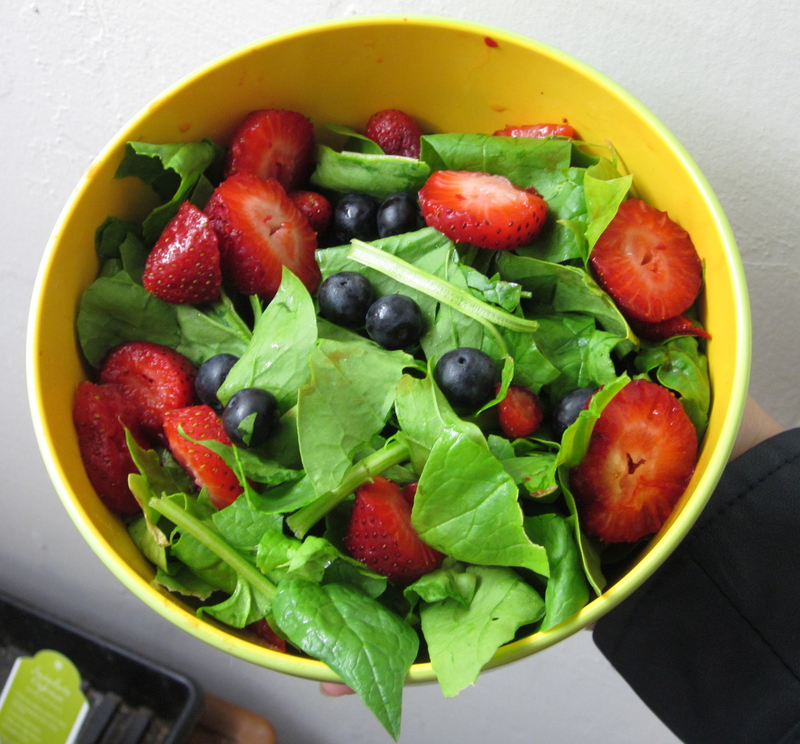 Plus, I got lucky this week because strawberries and blueberries were both 99 cents at grocery outlet, so this salad was incredibly cheap to make. Nuts go well with this salad—I probably would have preferred thinly sliced ones as opposed to these slivered ones, but that’s what I had on hand. I think walnuts or pecans would probably also go well in it. I can’t remember what kind of vinaigrette was on this salad the first time I had it, but I usually make a balsamic one. Go easy on the dressing, as the salad is tasty as it is. I would love to try a lemon vinaigrette on it sometime, which seems like it would be a nice refreshing pairing with the salad—but I’m sure its obvious by now that I like all things lemon. Yep—this salad is great on its own, but delicious with grilled meats. My dinning hall in the dorms regularly held “sizzling salad” nights where they would make whatever crazy combo of salad vegetables you wanted and top it with the meat of your choice. 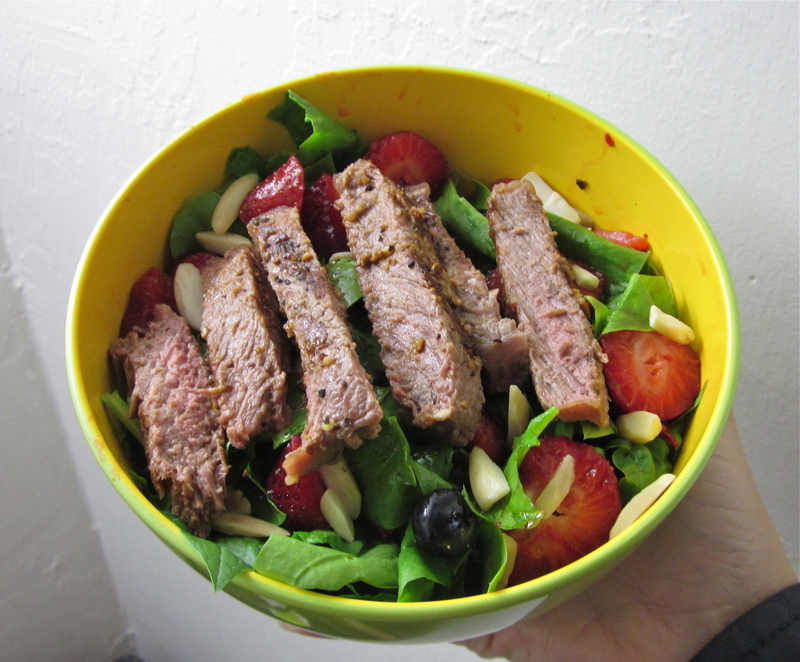 This taught me that just about any salad tastes good with grilled meat on top. In the version pictured, I just grilled a fresh steak on my George Foreman grill for a few minutes with steak seasons on either side, then let it sit for a few minutes before I cut it into strips. I meant to make it more medium rare than well done, but what can I say, I was multitasking in the kitchen and I’ve only used the foreman a few times. Either way, it tasted delicious. Normally, I top this salad with chicken, using frozen chicken breasts I have on hand. It may sound like shoddy cooking to some, but here’s how get it ready fast: I microwave it. First, I defrost it according to however long it suggests (3-4 minutes usually) then I set it to full power and cook it (also about 3-4 minutes). I aim for a little bit on the shorter time for the cooking part, pierce it to see if the juices are running clear to indicate doneness, then add the soy sauce and chicken seasoning and zap it for another 30 seconds to a minute. I know it sounds meh to cook chicken like that in a microwave, but what can I say? By the time I am hungry for this salad I often don’t want to wait too long for it. The chicken turns out tasty and I haven’t died yet! Depending on how much meat you add and how much salad you make, this can qualify for a meal in my book. I’ve been so busy with knitting and gardening that I haven’t had time to blog about either of them! I decided to break it down into small chunks, so even though I have already finished my cowl from the bean-dyed blue yarn, made significant changes to and progress on my custom fit raglan sweater and even planted the first plot of my summer veggies (! ), I am going to save those for later posts. 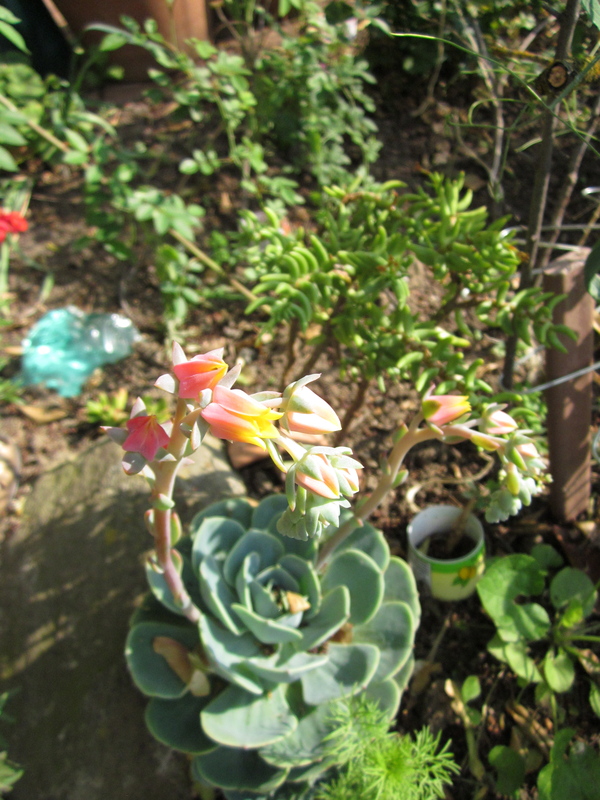 and this pink and yellow blooming echeveria, a succulent (unrelated to the trailing green succulent in background, which should be in bloom with small pink flower soon). 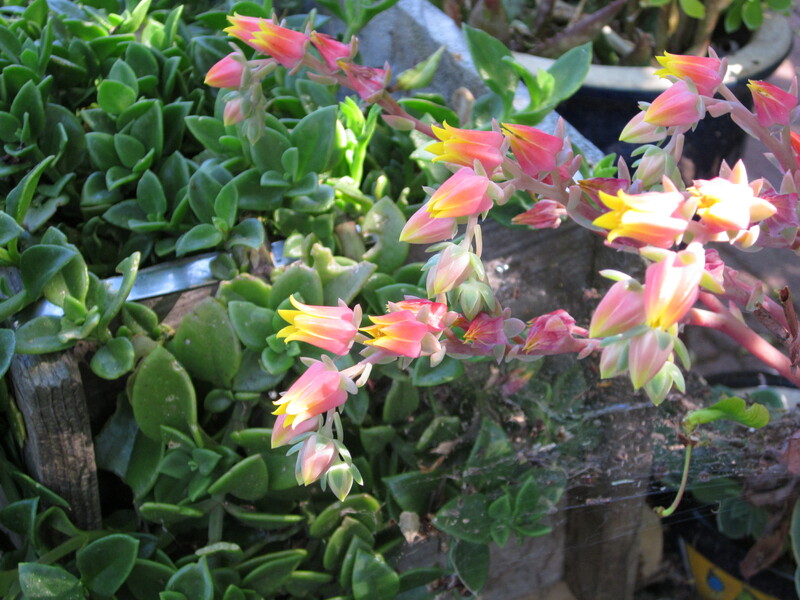 What do these plants have in common? They were all free! 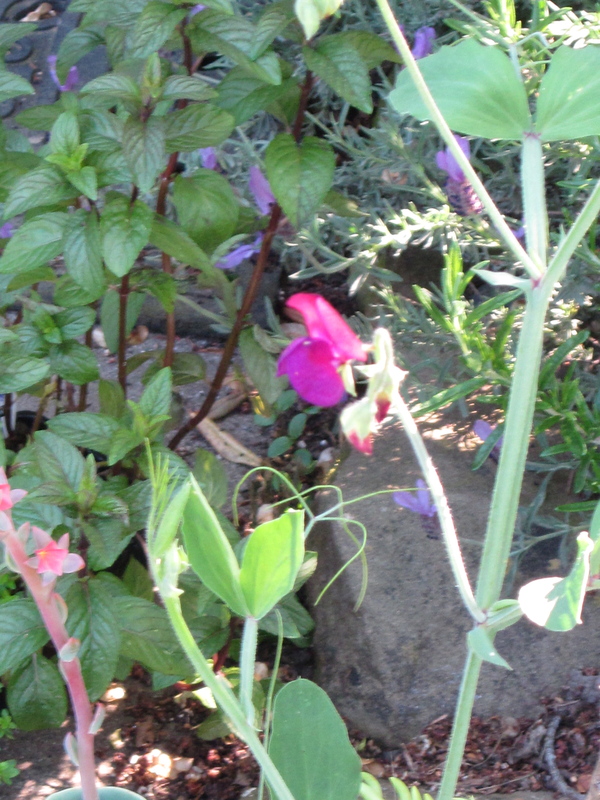 Free is an important priority in my garden. 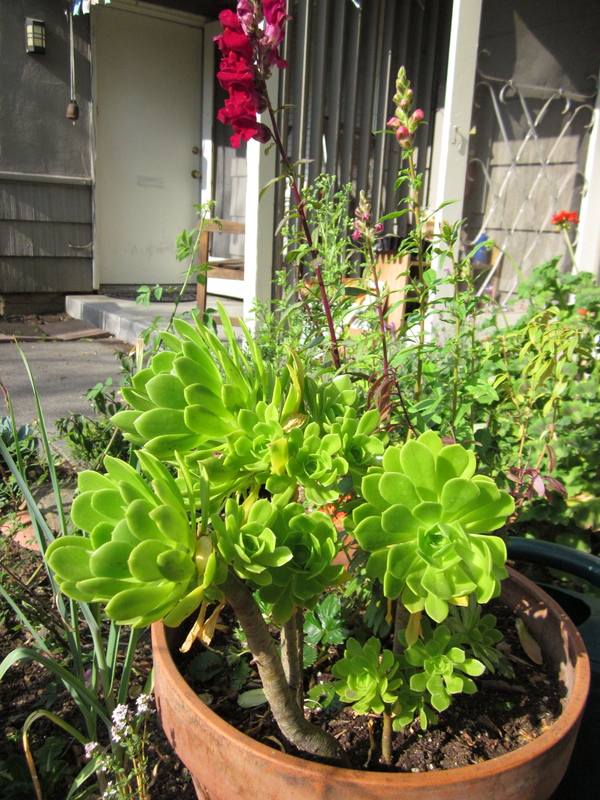 These plants came from giveaways, neighbor’s yards (with permission), or wild seeds. 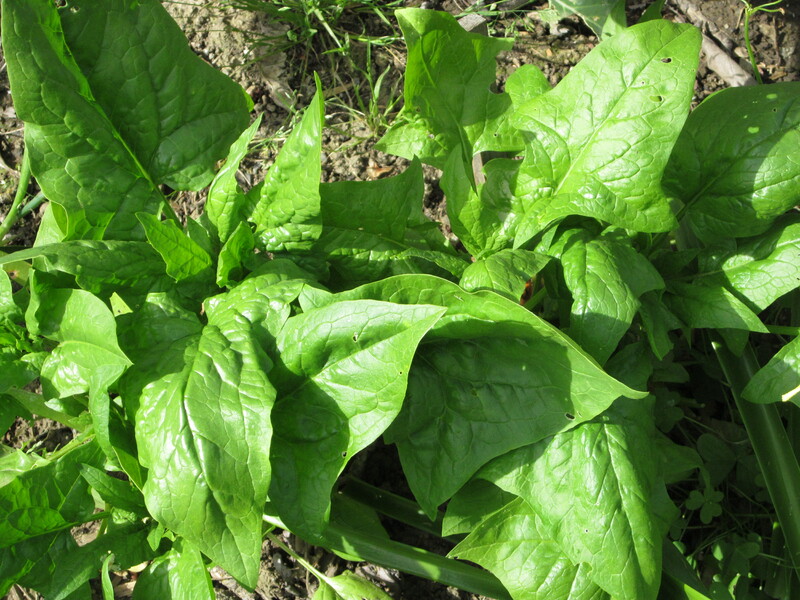 Spinach did fantastic in this spot—my favorite use for this has been salads with strawberries, blueberries and vinaigrette. Broccoli finally came in. 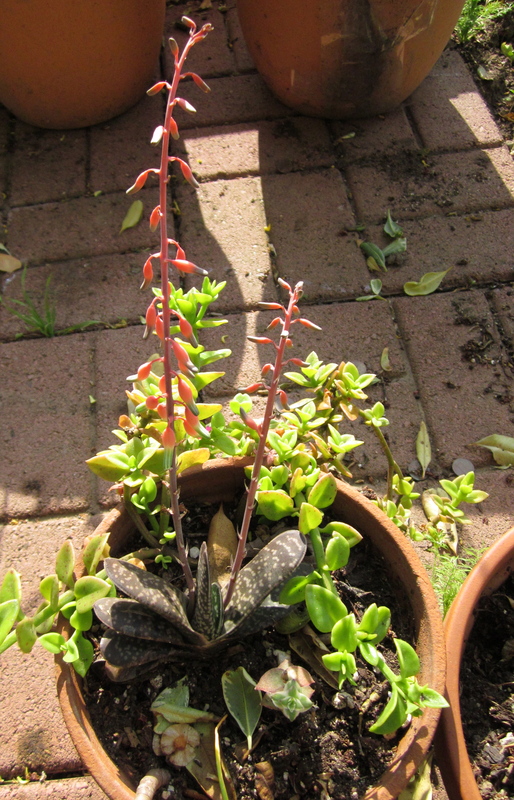 Just in time too, if it had waited another week it would have probably flowered in the 90 degree heat. 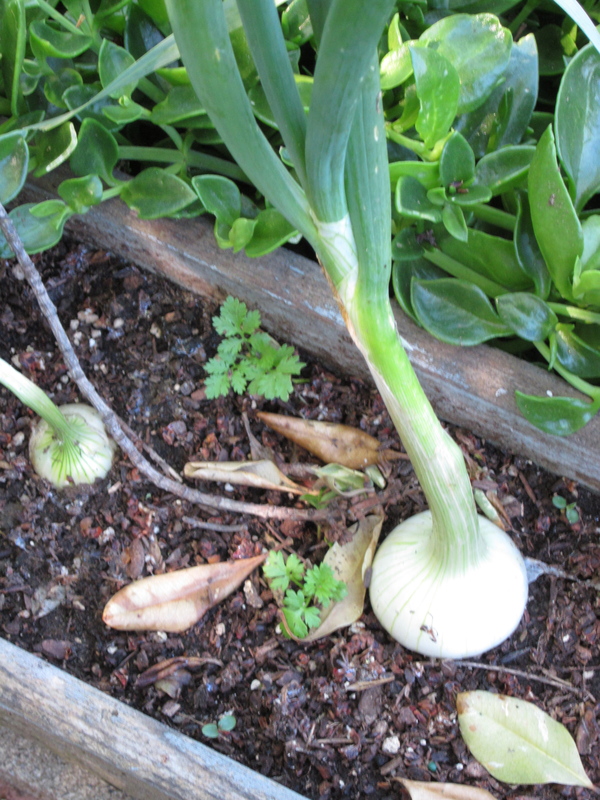 And onions—I planted these all over the place in the fall, some like these are ready and some are not even close, so I will probably continue to harvest them throughout the spring if I can. 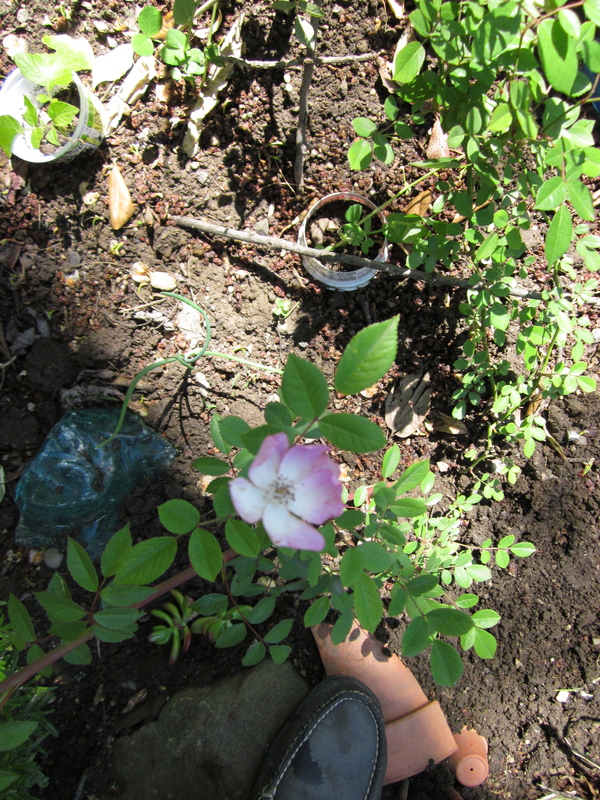 The new addition to my gardens this year is actually one you won’t notice: compost from my worm bin! The purpose, of course, is for the worms to create some soil building compost from my fruit and veggie scraps so I can use it in my garden. I went to a workshop put on by Project Compost at the beginning of March (they do one once a quarter on campus), where I got my very own free worm bin and worms. It fits nicely under my sink. I thought I understood the basics of composting, but it works a little different for vermicompost. 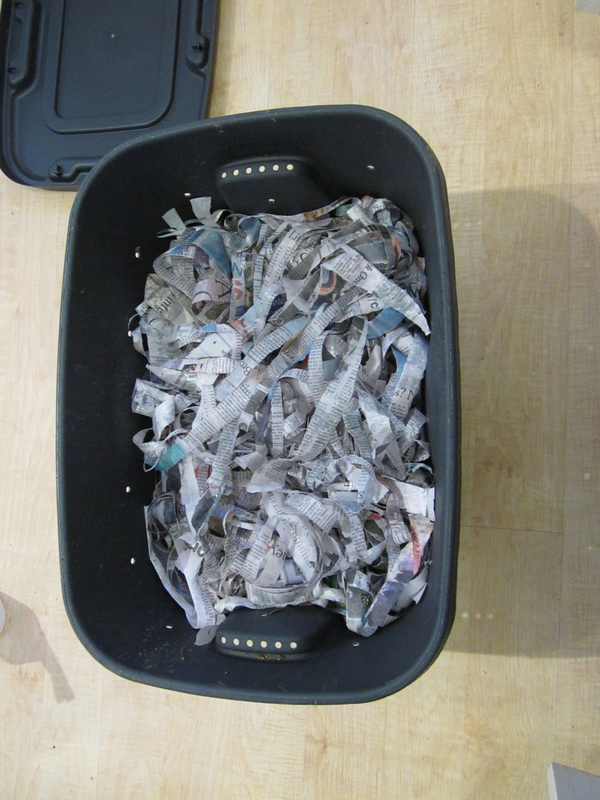 For worms, the bin has to have holes drilled in it for air, shredded damp newspaper inside for them to move around in, some sand they can use to digest their food (without teeth), and the right amount of food scraps. Right now, my worms eat about 1/2 -3/4 cup of food scraps a week. 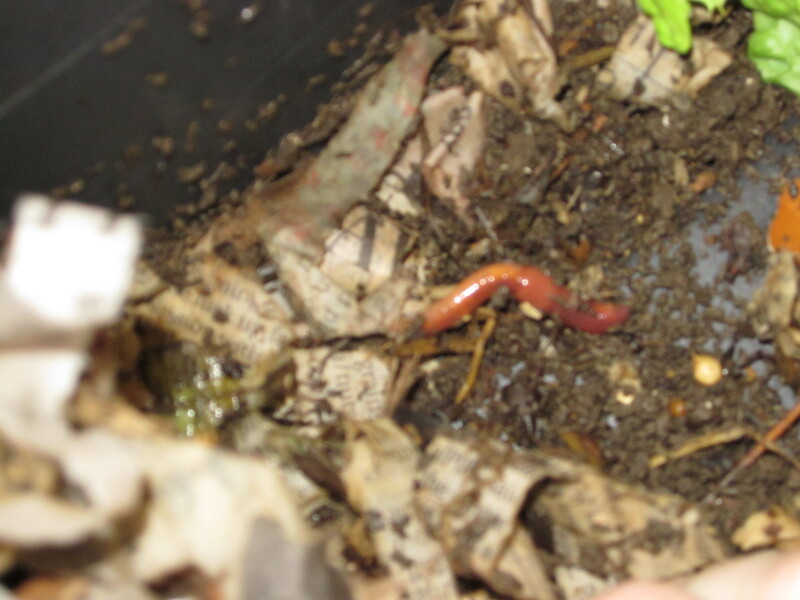 At this rate, I hope to harvest a decent amount compost from them by the end of May.The worms are red wigglers, which are different from earthworms in that they can survive in this kind of non-soil environment and they can eat a ton and reproduce quickly. I noticed a bunch of tiny baby worms in here recently, so they seem happy to me! I also went to a composting workshop put on by the City of Davis, which had excellent info on worm bin composting including how to construct a bin and where to get your worms. 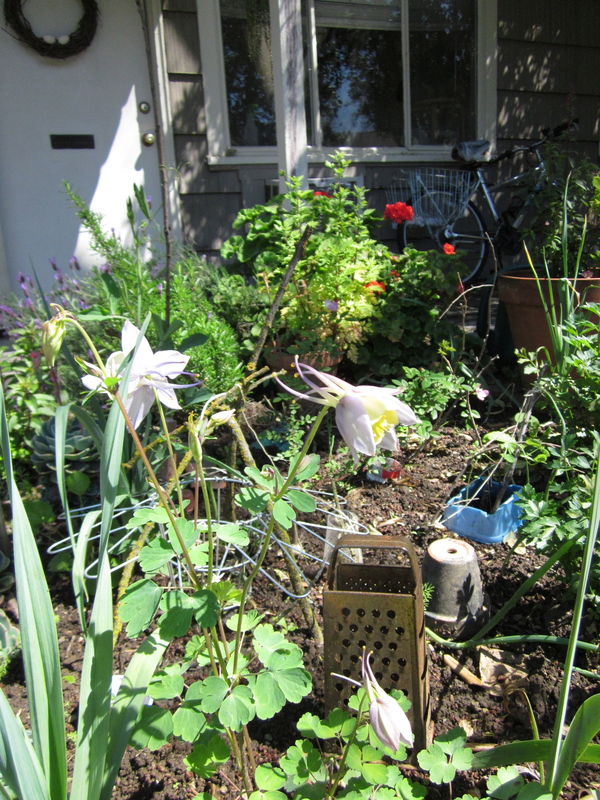 For instance, I learned from the city workshop that the holes drilled in my bin from project compost were too big and would let fruit flies in. I have since taped strips of window screen material over the holes, so that air can still get in but flies cannot. 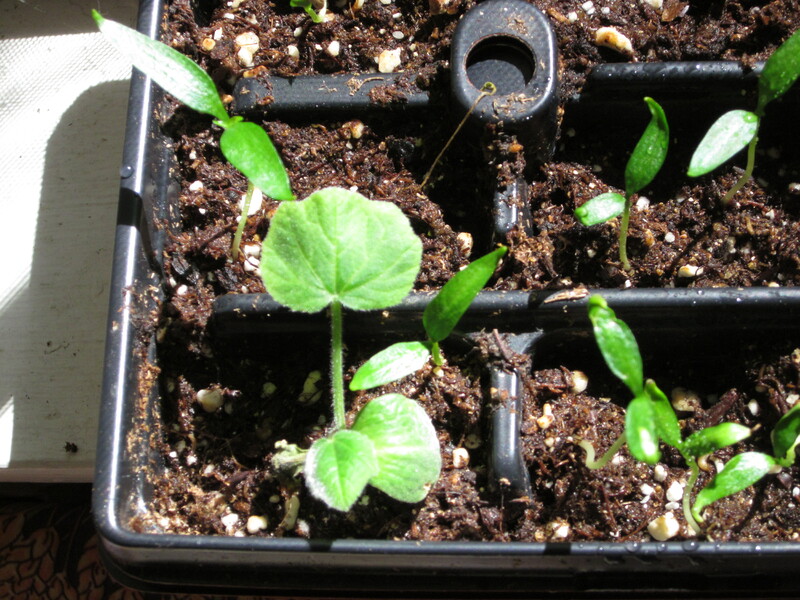 Another cool thing I learned from the city workshop: seeds left in the compost bin often germinate. The damp environment and the rich compost are apparently an ideal combination. So I decided to see for myself: I left some bell pepper seeds attached to the scraps. Two weeks later, I had lots of crazy looking seedlings that I pulled out of the bin! 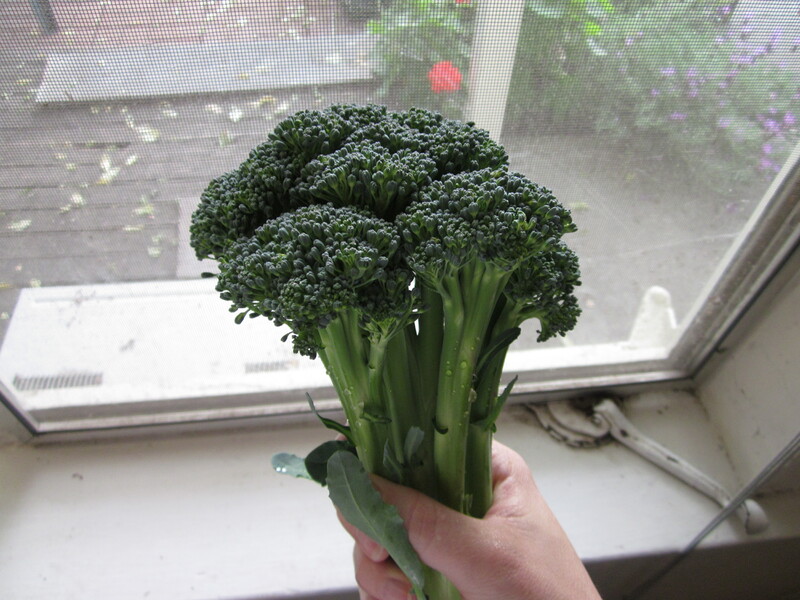 As you can see, the leaves were a sickly yellow color from the lack of sun, and the stems were all twisted. 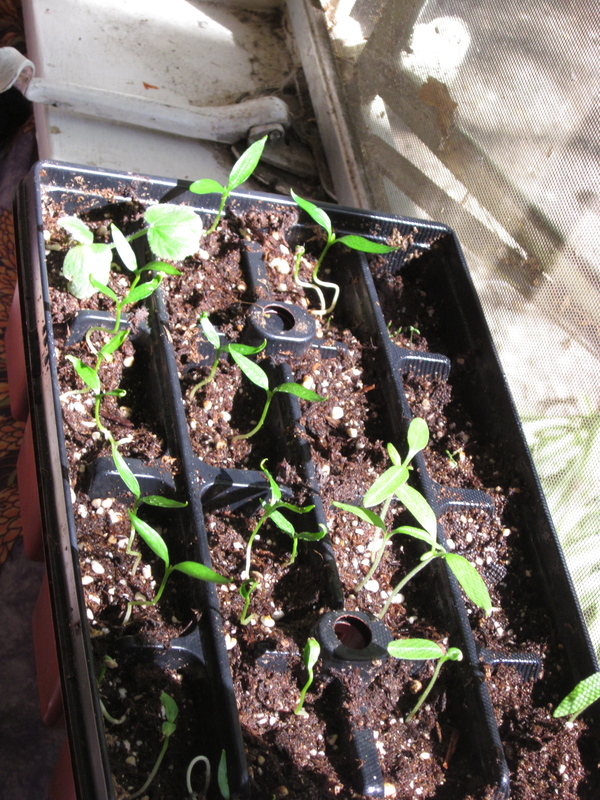 Also, apparently I had a random squash or cucumber seed you’ll notice in the bottom righthand corner. 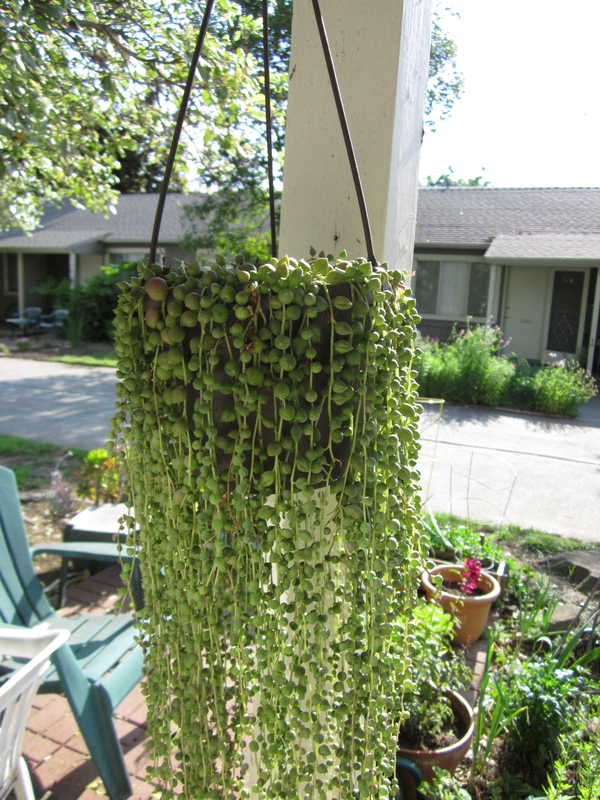 Of course, once I pulled these out of the bin, I had to try planting them. I put them into some starting medium and stuck them under my grow light. I didn’t expect all of them to live, but the results were actually pretty good! 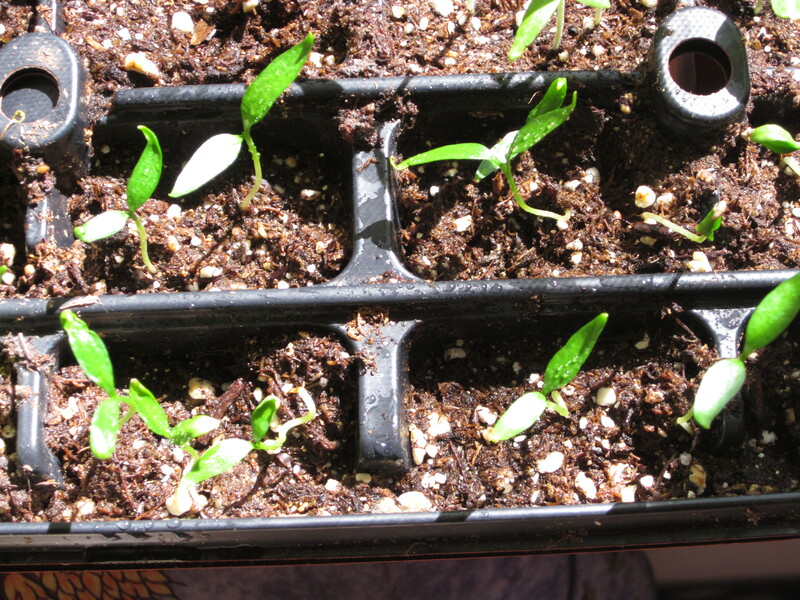 Most of those are the bell pepper seedlings, along with the one unknown squash like seedling in the top left corner and a few tomato seedlings on the right. The tomatoes look similar except they are light green and have straight stems (I had tomato plants that were much further along, but I set them outside too early and they died). 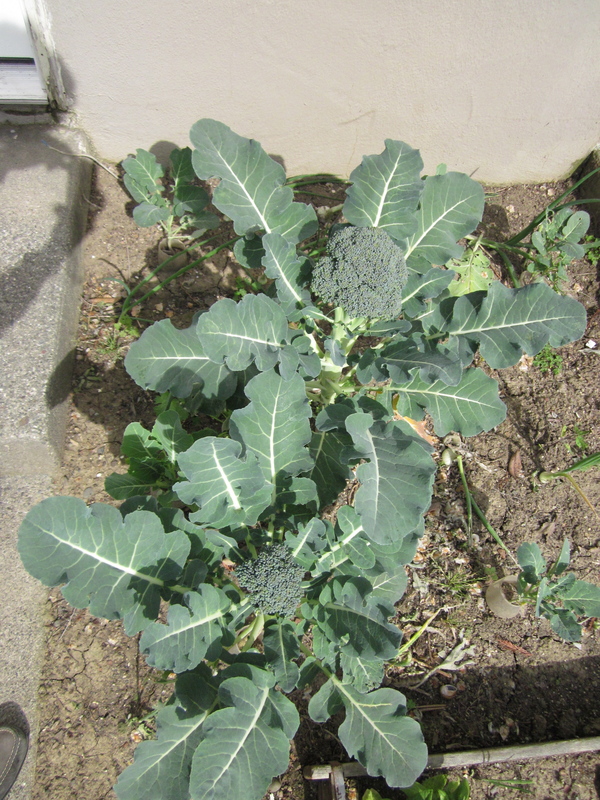 I can’t believe how productive this compost bin has been already–and I haven’t even harvested the compost from it yet! This is what happens when I put off posting on this blog: too many things to write about! I narrowed it down to just these two topics for the moment. I’m a fan of (harmless) April fools pranks.. In my elementary school diary, I kept track of which jokes worked and which didn’t (turning on the windshield wipe and turning up the car radio in my parent’s cars before they went to work: yes getting anyone to drink the “lemonade” in the fridge that I made without sugar: no). So apparently I have always celebrated this holiday. 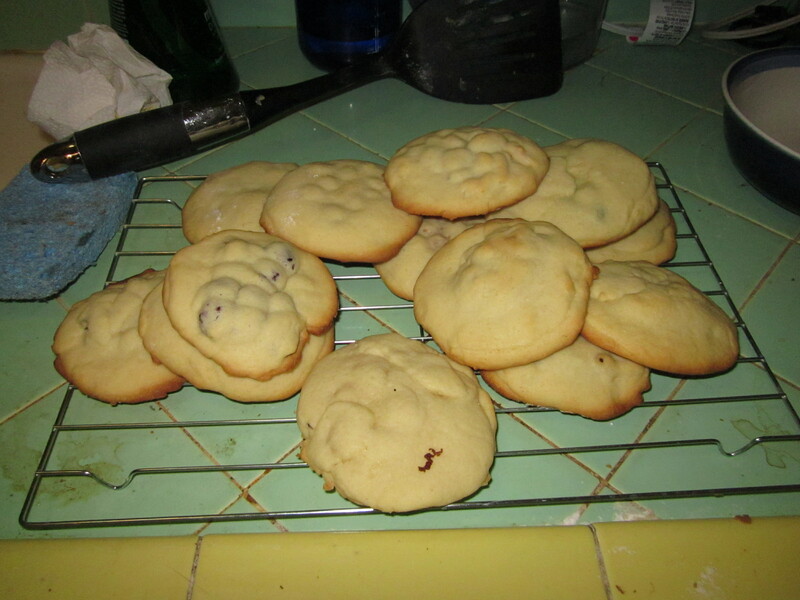 I used this recipe for the sugar cookie part, mainly because it makes a ton and I was going to use one cookie on the top and one on the bottom to make them. 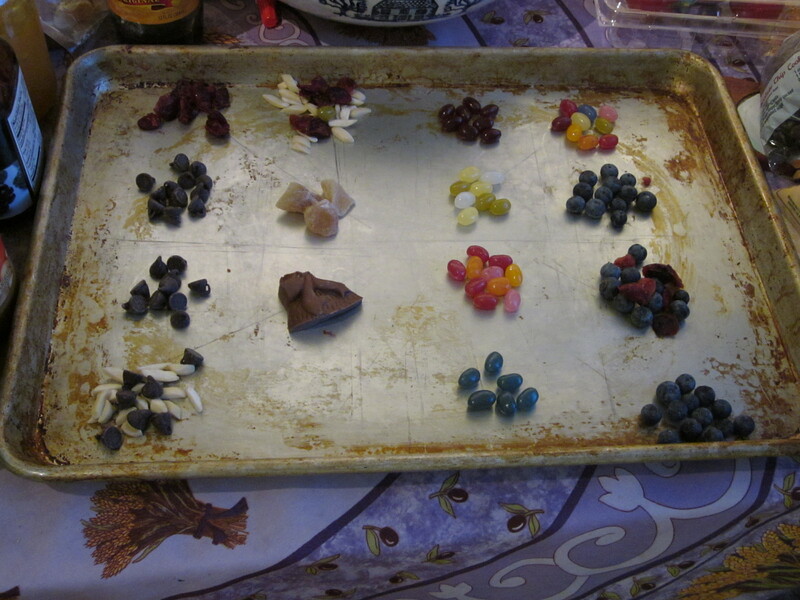 Coming up with mystery ingredients wasn’t too hard: I made most of them “good flavors,” as you can see: blueberries, chocolate, jelly beans, etc. 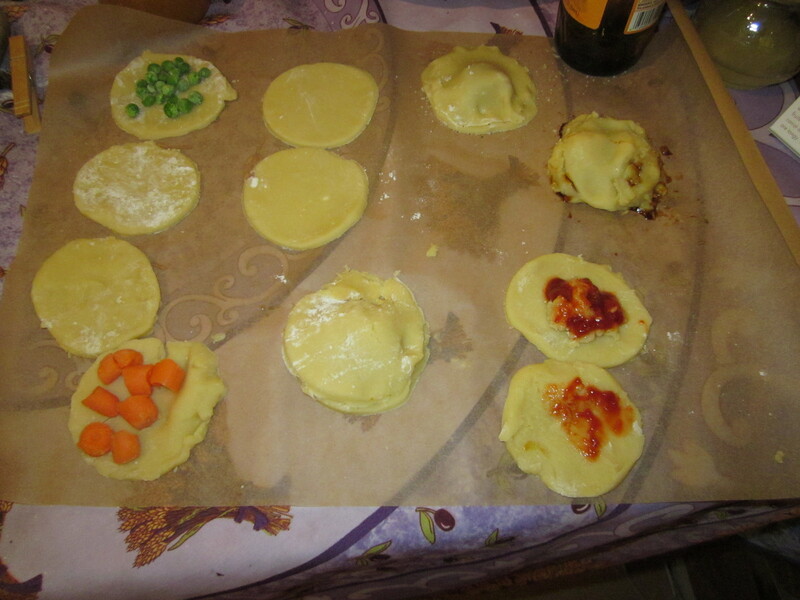 But I also made a few “bad/weird” flavors, like carrot, peas, and mustard. The hardest part about doing this was rolling out and cutting the chilled dough (with a drinking glass) before it got too warm and sticky to work with. The results? It really is hard to tell which is which! the responses I got were mixed, but personally, I liked the surprise factor. I ended up with extras, and I’ve been including a cookie with my lunch this week. I had the mustard one yesterday…I can’ t believe I’m saying it, but that was a good cookie! Who knew? 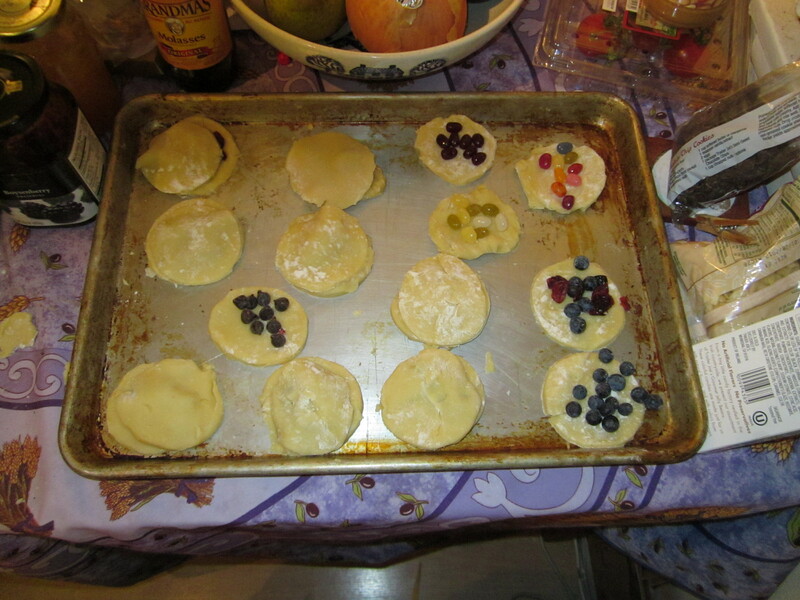 Those are two of the eggs I used while making the sugar cookies. 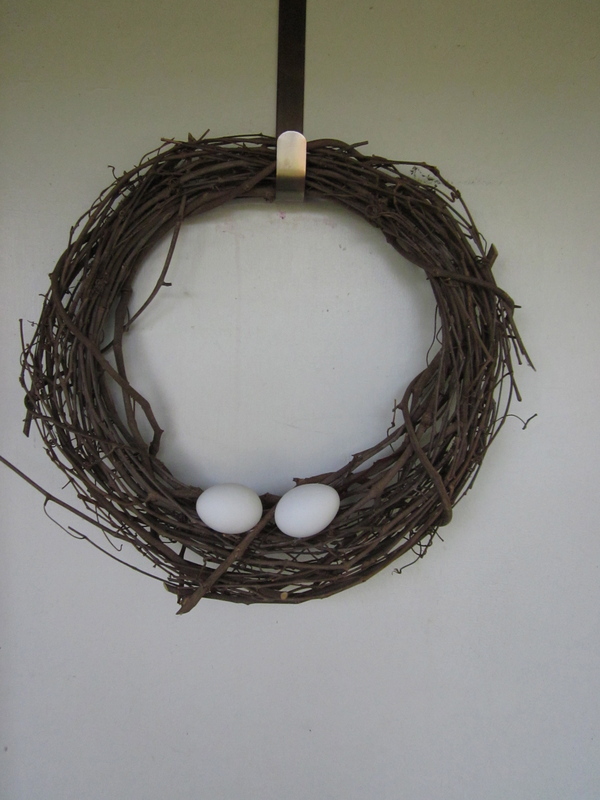 I had never blown the insides out of an egg before without using specialized tools, but after googling how to do it and reading the first tutorial I came up with, I found out that it was pretty easy. 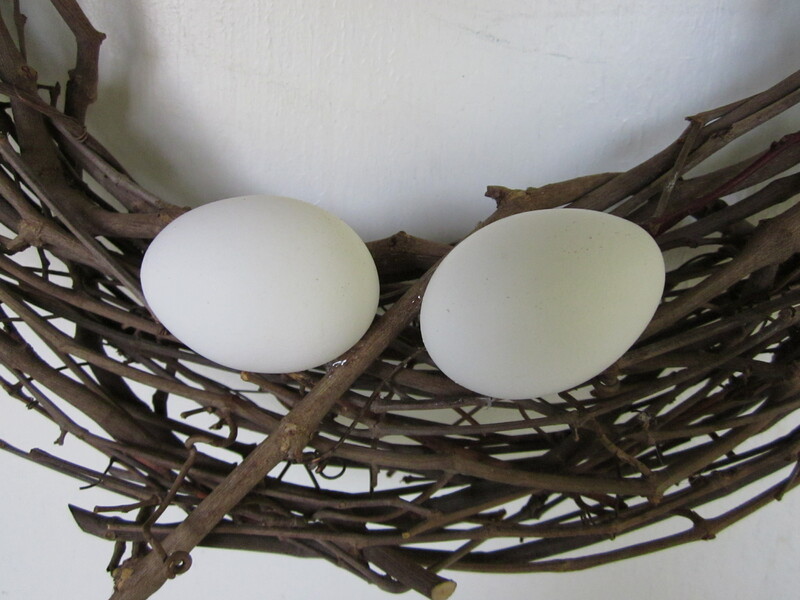 I used two different sized sewing needles to make the holes at either end, an unfolded paperclip to break up the yoke inside, and a regular plastic straw to blow the inside of the egg into a bowl. The eggs didn’t break. After that, I decided I wanted something inside as well. As it happens I have some old calendars that I keep for arts & crafts purposes, and one of those was a Peter Rabbit calendar. 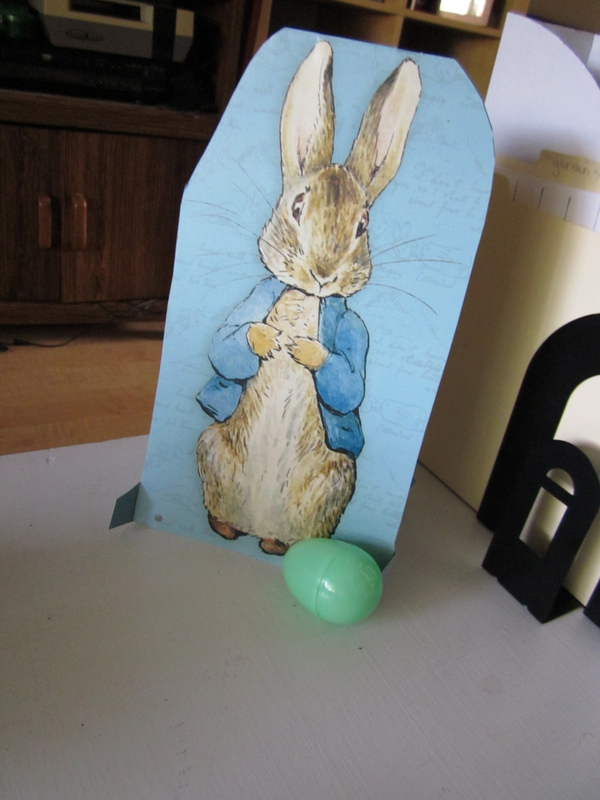 So I cut the front and back cover off together and made a little standup rabbit to guard my one plastic egg. I don’t know why, but I like having him on my coffee table. There was a little stuffed lamb there to, but Jo decided that was her new toy. 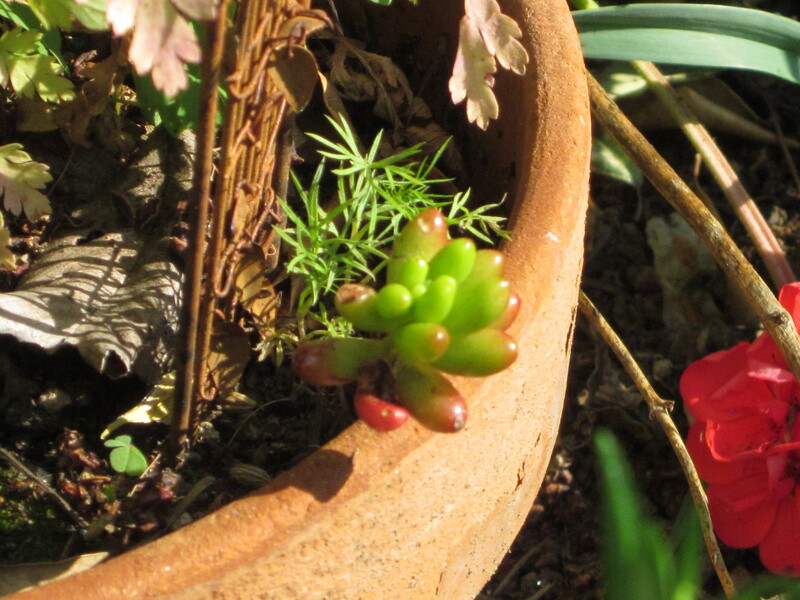 Ok, next post will be Spring Part 2: gardening post!